A final update on 20/September/2017: CITC has finally issued a statement that most VOIP and video call services will be "unblocked" in Saudi Arabia. This post will be updated with the latest news regarding the issue so make sure to bookmark it. â€¢ iPhone 4 units with FaceTime disabled have the following model numbers: MC603AE and MC605AE for units sold in Saudi Arabia, UAE and Qatar. MC603AB and MC605AB for units sold in Egypt (and Jordan once it’s available). â€¢ FaceTime works on iPhone 4 units running iOS 4.0.2 but if you update to iOS 4.1 FaceTime will be disabled on these phones. â€¢ FaceTime is available in Tunisia according to Apple Tunisie page. 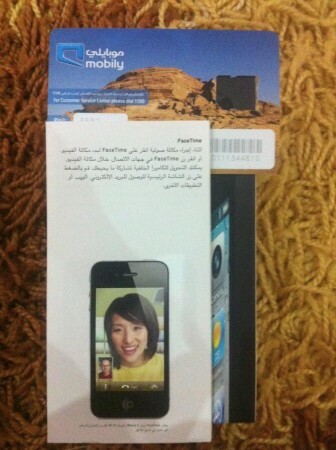 â€¢ iPhone 4 units imported from UK, Hong Kong, Canada etc have no issues with FaceTime. Carrier Settings do not disable FaceTime as far as we know. â€¢ Mobily’s response is mixed: Mobily CEO blames Apple while customer support blames CITC. â€¢ There’s legal action from a Saudi lawyer to reactivate FaceTime. â€¢ Apple did not officially respond regarding FaceTime being disabled but they did add a note regarding FaceTime in some Middle Eastern countries. â€¢ According to this thread on EmiratesMac iPod touches sold by iStyle in UAE have FaceTime disabled. â€¢ Update: I have posted my theory regarding the reason why Apple disabled FaceTime in Saudi Arabia. â€¢ Update October 19: FaceTime does not work on iPod touch 4G units sold by Arab Computers/Arab Business Machine and carry the model numbers: MC547AB, MC540AB and MC544AB. â€¢ Update October 19: Apple confirmed that by not listing FaceTime as a feature on Middle East iPod touch pages. â€¢ Update October 19: FaceTime coming soon to the Middle East, at least to Qatar and apparently Government policies in Qatar prevented initial FaceTime availability. â€¢ Update October 19: As for Egypt, according to Vodafone Egypt, the country’s NTRA decided to block FaceTime. â€¢ Update October 24: Apple released FaceTime for Mac. It works but you cannot set your country to either Saudi Arabia, United Arab Emirates, Kuwait or Egypt. â€¢ Update on Jan 15: iOS 4.3: No FaceTime for Middle East. â€¢ Update on March 11: FaceTime is restore via carrier update on Vodafone Egypt, Mobinil Egypt, Orange Jordan and Vodafone Qatar. Still waiting for carriers in Saudi Arabia and United Arab Emirates. What do you think? What is the reason for disabling FaceTime in the region? What should we do about it? This facetime nonsense is joke, which makes it even more frustrating.. We just can’t stop acting like a primitive third world country. Many of you will disagree with what I just stated, but I’m Â speaking interms of the common mentality and social ignorance. I’ll tell you why! I am not sure what are the reasons that caused apple to disable FaceTime for some countries in the region. It doesn’t matter at this point. Apple clearly states it in it’s Â website according to a previous article in this blog. We can all agree that Apple is a big Corp. that knows how to sell. They are not stupid. How come there is no word from apple till now? because they don’t want to show that they are involved now that Mobily Â could be facing a lawsuit against it’s costumers. This is relevant because a ruling against Mobily will harm Apple as well. Since, Apple still controls the devices, and can easily turn the feature back on with the next upgrade. Apple chooses to be passive about this matter at least for the time being. In this situation, there is no sane answer nor reason. If Mobilys claims are true that CITC whom banned facetime. Then what will CITC have to say to the disturbed public? that their regulations wanted to insure a competitive market, and stc and zain are left out. Then why Mobily is iPhone exclusive? Or perhaps it was banned for social and religious reasons. Thats even worse of a answer than the first one. Coz we have been through this many times before (radio, tv, phone with cam, etc..) the list goes on. AppleÂ face-timeÂ requireÂ some futures with the currier but our carriers not ready for it with large numbers. To the best of my knowledge, Facetime is initially only possible over Wi-Fi to Wi-Fi so therefore, it doesn’t affect anything to do with the carrier, that is, it is not using any bandwidth or time charges, right? So, why would the carrier remove the feature? From other posts, I see that Apple is getting the blame now, ha! I am trying to buy iphone 4 for the last 2-3 weeks but there is not any available in the market. I checked mobily , jarir, extra …etc. Its available only in a few I-techia stores but the prices are extremely high. The price for 32gb is 4999 SAR……………. And only 1 available….. Does anyone have any idea about that ? When will it be available in Mobily again ? OK, so, if I buy an iPhone with these model numbersÂ (factory unlocked right?) and take it abroad in a country where FaceTime works (France, USâ€¦), it will still not be activated because iOS 4.1 checks the model number and deactivates FaceTime where ever you are? DARKVOID FROM EMIRATESMAC DID IT AND ACTIVATE FT AGES AGO….! well, i have came across some sort of tweak on cydia last night by the name of “facetime enabler” which enables facetime on the listed disabled models, has anyone tried it yet?? i m still using os 4.0.2, so i would really like someone with a jailbroken phone with 4.1 os to try and confirm it. It’s not a security issue – you can still send encrypted files over the net. It’s not for maintaing virtues and preventing vice/promoting virtue. These monopolists (Du & Etisalat fix their prices) want to keep their strangle hold on the vast fortunes telecomms can make and VoIP is too much of a threat to their business model. It’s up to you guys to force them to open up to real competition. Good luck. I was able to use Facetime to phone my parents and children from Dubai to UK and South Africa but since ios6 upgrade i cannot anymore. I think this is unfair if the UAE have implemented this. Why would they? It is very sad that i now have to spend so much money on phone calls and cannot see the faces of my loved ones. I think that there are more good people needing this function than there are bad people using skype or FT for their own sordid use.